I began riding horses at age eight. It was my life; it was all I could think about. I would sketch horses on my folders at school, study every breed I could from my weekly school library book, and in 1989 became obsessed with the famous racehorse Secretariat. This chestnut thoroughbred was the greatest racehorse of all time and continues leave that legacy as his titles are still left unmatched. Secretariat died in 1989 and I followed the story intently. At 11 years old, I wasn’t necessarily sad that this horse had died, I was more intrigued by the story that followed him. I knew it was talent within the breeding process that led to his many winnings, but there was also training, and discipline, and love, and a team of care-givers who saw a gift and strength in this animal. But to me, Secretariat wasn’t just a racehorse, he was a symbol of perseverance and power. An animal that unabashedly ran his heart out, to his fullest, with focus and will, obedience and power. Being the introverted, shy, deep-thinker that I was at the time, I found I wanted characteristics of Secretariat in my own self. I loved his story and I fell in love with the power and fury of the thoroughbred breed. After owning a quarter horse (Babes. I know. The name…) for four years, it was time I moved on. Though I loved Babes, he wasn’t growing with me in the show ring. I was moving forward into a more competitive show-jumping arena and he was happy to trot around and jump a few cross rails. 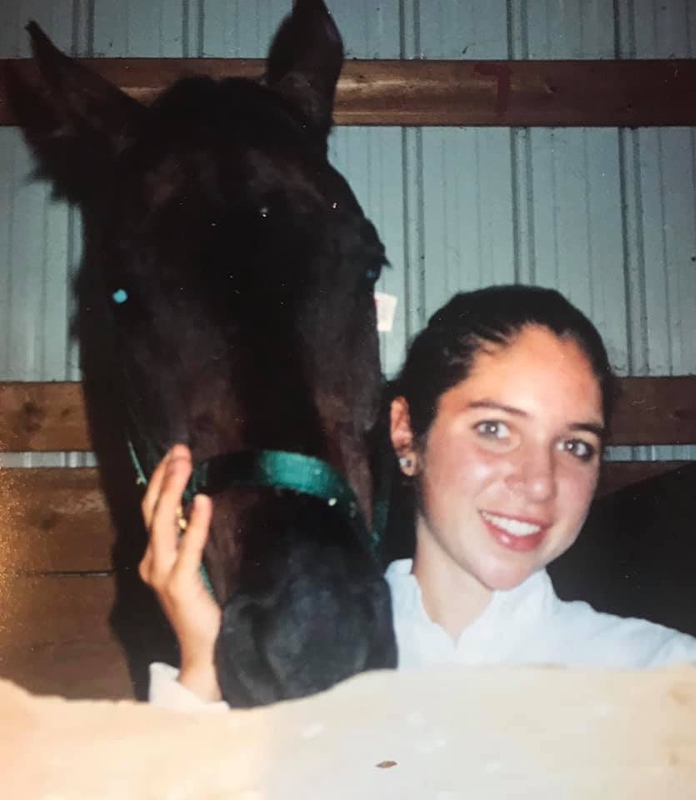 At age 16, I was given a Thoroughbred who needed some attention. He was 7 at the time and his owner knew the potential he had in the show ring, but didn’t have the time to invest. Butterflies in my tummy, little girl squeals, this was too good to be true! The Universe handed me a Thoroughbred! His show name was “Requests A lot”…which I always thought was kind of a funny name. I called him “Lots”. I loved that horse so much! He was tall, sleek, black, stunning, and the typical dumb jock type. He walked into walls because he was easily distracted. In the show ring, he became easily side-tracked when the pretty fillies strolled by. In fact, I had to buy him a goofy helmet to wear in the horse trailer because on the way to the show ring, his nerves would get so high that he would accidentally knock his head from time to time during the drive. He was my boy and we knew each other to the depths. I recall burying my head into his neck weeping tears of heartbreak when my 9th grade boyfriend broke up with me. Lots didn’t move, staying completely still as he held that space for me. He knew, he felt, and he was there. In the happier times, we floated over huge fences and raced around courses in speed and vigor. In those moments, he and I were in full synch. A squeeze of my left calf, the tiniest pull on the reign with my right pinky finger gave his subtle cues of where to go and how to do it. He was always a nervous wreck and so was I. That’s why we made a good pair. We got each other, we honored each other—a connection I will always remember with love and will continue to regret not saying one last good-bye during his old age. One of the greatest lessons Lots taught me was about truth. In the simplest of ways. It was July and Lots and I were spending the day competing at our town fair. It wasn’t a fancy or competitive environment, it was the down-home, funnel cake, ferris wheel kind of atmosphere that you can imagine. I recall not coming very prepared. I forgot my chaps and his leg wraps, and I completely forgot carrots. He looked forward to those after our time in the show ring. I felt guilty about it, but figured, “eh, it’s just a simple show, he’ll be okay.” We finished our three competitions (can’t recall how we did) and I was brushing him down in the stall and affirming him with “good jobs” and pats on the neck. As I left his stall, and with no one around, I noticed a small brown bag of carrots outside of another stall. They weren’t mine. They belonged to a more responsible horse owner who thought of the details better than myself. Up to this point in my life, I had never stolen ANYTHING! I had a conscience that couldn’t allow me to live it down. But in that moment, all internal judgment aside, I stole four of those carrots. I gave them to Lots and I felt terrible. Like somehow they didn’t taste as good to him because of the intentional sin behind them. That moment ruined the whole day for me. The guilt was killing me. In retrospect, as an adult, I do see it was wrong, but there were a lot of carrots in that bag and I’m sure the owner would have been okay with it. But in my guilt-ridden 16 year old head, I had done something very wrong. And now, I couldn’t fix it. In fact, I found myself fixating on it as the days passed. That’s just the kind of kid I was and I own that. I see that trait in one of my own children and I smile inside. That child will learn to embrace it and to ride the lessons from it; to harness and guide the guilt and the inner voice as best they can. The lessons to follow will be immeasurable. As I travel and speak at various schools about mindfulness, a very large proportion of my presentations center around this idea of “Speaking Your Truth”. My intent in delivering this portion of my message is not to guilt-render a child into always telling the truth, instead it’s to encourage the child to speak his/her own truth according to how they are made as an individual, separate from the world, their family, and peers. As Jesus presented the ideas of living a full life in accordance to living truthfully and by his word, I believe we can expand this idea to also encourage one another to actually speak and LIVE their own truth within their own being. One thing I learned quickly when I moved to NJ 18 years ago was how bluntly everyone spoke to one another. People were direct, kind of quick, and to the point. It bothered me to no end for a few years and then I really became to appreciate it. And that’s how I choose to live my life now. If you know me well enough, if I’ve let you in deeply enough, you will know I’m an open book. You will see the real, the raw, the beautiful. It’s me, it’s how I’m made and I’ve learned that living truthfully and without shame can propel another human forward in his/her own walk in life. And isn’t that why we are all here? To encourage one another, to love, to support, and to move forward. Life is hard. It just is. How many good surprises come our way on a daily basis? Not many. We need to be the encouragers in the lives of each other. The encourager to the gas attendant when it’s 20 degrees, the encourager to the 7Eleven teenager working the night shift, and certainly the main encourager to ourselves. Kids now, more than ever, are inundated with the fakeness or the misrepresentation of life as it appears on the screens within their hands. They are being “taught” ethics, patterns of thinking, and how to relate to each other through a device rather than true human connection. How can a child learn to own their identity in this way, let alone live their life according to the truth of their being? I’m passionate about teaching children the power of their voice. Instilling in them that they have a voice that matters. And I’m not suggesting a political platform-ish way. Rather, an inner, this-is-who-I-am kind of way. Through the mindfulness exercises I teach in my children and teen yoga classes, my school staff presentations, and lectures at yoga events, my core message remains grounded in the idea of being true to Self. As you head into 2019, I encourage you not to put too much pressure on yourself. You really are amazing in who you are in this present moment. Give pause and honor yourself and the gifts you have to share with others. Yours are different than mine and I need yours to move me forward in this life of disappointment, joy, and daily complication. Resolutions are fine, but self-love and self-honoring are more important. Be sure to live truthfully when it comes to word and deed, but live truthfully in accordance to your soul’s purpose and your inner desires. Take the painting class, have a conversation with the family member where you can extend forgiveness, help the person you don’t want to help, speak up for the child in your classroom who needs the extra support. The truth will set you free, YOUR truth, the power within you. And just as Secretariat ran unabashedly around that track with speed, strength, and power, you too will grow stronger in your own power once your discover the power of your voice.